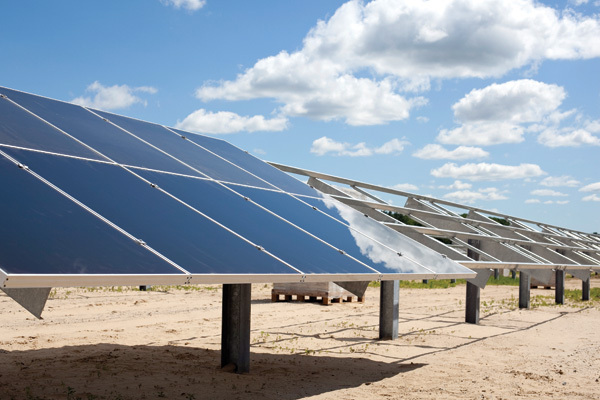 Spurred by Ontario’s feed-in-tariff, SunEdison and SkyPower Ltd. recently brought into service two ground-mount solar parks, SunE Sky Norfolk I and SunE Sky Norfolk II, that are now generating 18.3 MW in Canada’s economic heartland. The Norfolk I and II solar power sites have a sandy soil profile. Construction crews had to make sure the pilings were deep, so there would not be any frost heaving in the winter. The province of Ontario is home to Toronto, Canada’s largest city and the country’s center of commerce. But it’s also quickly becoming the center of solar development for the country, thanks in part to the Green Energy Act and its predecessor, the Renewable Energy Standard Offer Program (RESOP). Ontario’s Green Energy Act, passed in 2009, is designed to wean the province from coal-fired energy production by 2014. The legislation also spells out a series of steps designed to streamline approval for renewable energy projects, establish standardized pricing through a feed-in tariff program, attract investors, and create local business and employment opportunities. Toronto-based SunEdison Canada, a subsidiary of MEMC Electronic Materials, and SkyPower Ltd. have been some of the leaders in this evolution with their joint venture projects—the 9.1 megawatt First Light I Solar Park and more recently, the 18.3 MW SunE Sky Norfolk I and II solar farms. Jason Gray, SunEdison vice president of Canadian operations, praised the provincial leaders for their forward thinking in creating the RESOP and the subsequent Green Energy Act. "I think it was a progressive view to get all of the coal generation offline," he says. "Renewable energy will boom, and it will also position Ontario as a center of excellence. "Many of the other Canadian provinces are starting to consider solar programs, and they’re at various stages," he added. Being one of the first does have its own unique set of challenges, Gray says. "We were doing so many of the first things in the province, and there was a fair learning curve," he says. "We spent some extra time with the utilities getting them more comfortable with the technology." At the time First Light I, a 90-acre project near Stone Mills, went online in September 2009, it was the province’s first utility-scale solar generation facility. It also was the largest ground-mount PV system in Canada and the third largest in North America. In addition, it was named the 2009 Solar Project of the Year for Ground Mount by the Canadian Solar Industry Association (CanSIA). SunEdison and SkyPower formed the joint venture SunE Sky in 2007 and began exploring possible projects. From the scoping sessions, came First Light I, Norfolk I and II, and a handful of others. As part of the arrangement, the two firms build, finance, and maintain the projects. They were able to secure a 20-year power purchase agreement from the Ontario Power Authority for 42 cents per kilowatt hour under the province’s RESOP. It wasn’t too long after that the world-wide economic recession hit, tightening access to credit in most markets. "It slowed discussions down, and we spent a bit more time working with the bank credit committees to get them comfortable with regards to the project," Gray says. "SunEdison continued to close on solar projects while much of the industry was put on the sidelines for a year or so." But bankers and the investment industry are apparently getting more comfortable with renewable energy. "I think as more projects come on line, there’s more understanding of the asset as an investment. Solar is moving from one-off boutique financings into large infrastructure style transactions." Ontario’s Green Energy Act, passed in 2009, is designed to wean the province from coal-fired energy production by 2014. The legislation also spells out a series of steps designed to streamline approval for renewable energy projects. The Norfolk project was split between two sites—one in Simcoe and another five miles away in Port Dover—because of grid constraints. "There’s only so much grid capacity," Gray says. "We often split these types of solar projects to minimize grid upgrades." Nevertheless, the two parks were close enough to take advantage of economies of scale, Gray says. Each site is about 100 acres. SunEdison and SkyPower sought permits for the sites in 2008 and 2009. Gray says it typically takes 12 to 24 months to obtain the necessary permits, and Norfolk I and II were no exception. The two sites had a sandy soil profile that had been planted to low-grade agricultural crops. "It was difficult to farm, so it made a lot of sense using it for solar," he says. "It was certainly not fine agricultural land. "With sandy soil, you have to make sure you are driving the pilings deep enough that you don’t see any frost heaving in the winter. One of the most important factors with a solar farm, and particularly one in Ontario, is having a robust geotechnical study done detailing how deep those pilings go." Ground was broken on the projects in March 2010. Gray says SunEdison acted as the general contractor, having representatives on site at all times to oversee the projects. It also drew from in-house engineering expertise. "It’s not as simple as it looks on the surface to construct one of these farms," he says. Local contractors provided the high- and low-voltage services to hook the solar parks to Hydro One and Norfolk Power, the local power providers. Sharp supplied the 14,800 121- and 128-watt thin-film panels from its Sakai City, Japan, manufacturing facility. Gray says SunEdison has strong relationships with Sharp and knew the firm could deliver the quality and number of panels needed in the short time-frame. "Having done a lot of different projects globally, we have our supply chain and logistics down pretty good," Gray says. Project engineers opted for a fix-mount system because of its value, especially in conjunction with the thin-film panels. "For this project, the best bang for the buck is using fixed-mount with thin-film," Gray says. "Putting thin-film on trackers isn’t economical." The racking, which consisted of I-beams and other parts, was fabricated by a U.S.-based roll former. "There isn’t a lot of racking pre-assembly that can be done. Most of the racking is put together in the field." The large influx of materials, including the panels and racking, did mean some staggering and staging to avoid any transportation bottlenecks. At the peak of construction, each site had about 125 workers, although they would rotate between them, depending on where they were needed. Sharp supplied the 14,800 121- and 128-watt thin-film panels from its Sakai City, Japan, manufacturing facility. 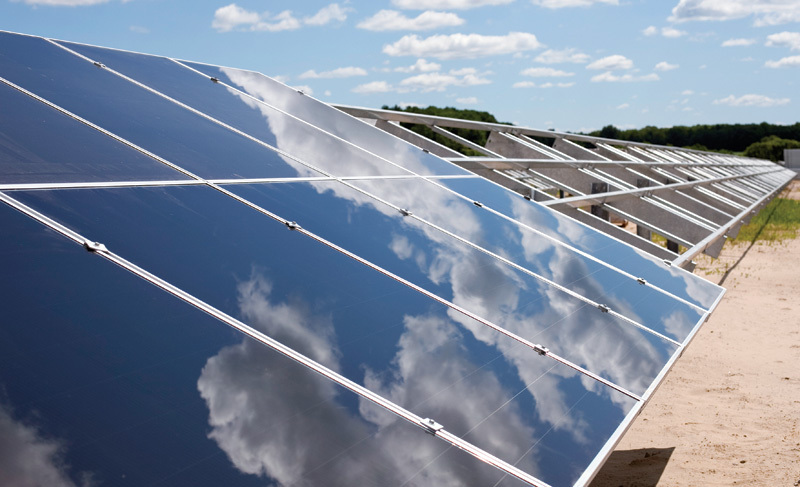 SunEdison has strong relationships with Sharp and knew the firm could deliver the quality and number of panels needed in the short time-frame. Much of the work is repetitive, and project managers set measurable goals to ensure the project stayed on schedule. "In many ways, a solar farm construction site is more similar to an assembly line than a regular construction site," Gray says. Sixteen Satcon inverters convert the DC power to AC. Gray says project leaders went with Satcon because of what he called the inverters’ "bankability" and proven track record. "We have a 20-year power agreement," he says. "Certainly, we designed the project to have more than a 20-year life." The project came online this past September. Although the workers no doubt enjoyed the summer weather compared to having to work in the winter, the waning fall light was not optimum for starting up a solar park. "You do need a certain amount of production data to make sure you commissioned the site properly," Gray says. "Ideally it’s a bright sunny day in the summer." The project has been doing well since start-up. "We’re pleased with the performance. Certainly it’s been what we expected to produce on a weather-adjusted basis. "That’s where it’s allowed us to use our expertise. It’s one thing to be able to get a site up and running as quickly as possible. It’s another to have a site perform as expected." SunEdison isn’t stopping with Norfolk I and II. The firm has a project in southwest Ontario under development that uses crystalline panels on single-axis trackers. It is expected to come online during the second quarter of this year. "Eventually, as the cost of trackers and crystalline panels comes down, they make more and more economic sense," he says. SunEdison has also recently announced an additional 30 MW of utility-scale projects that have been awarded by the Ontario Power Authority. These projects are being built under the feed-in tariff (FIT) program, which requires at least 60 percent domestic content. As a result, MEMC, SunEdison’s parent company, is teaming with Flextronics of Newmarket, Ontario, to produce MEMC-branded solar panels that will be used on SunEdison projects. SunEdison also has an arrangement with Samco Solar, a division of metal fabricator Samco Machinery Ltd. of Toronto, to build the Delta Rack, SunEdison’s proprietary, non-penetrating roof-mount system. "I think as the FIT market really gets going, it will be interesting to see the supply chains in Ontario get much more sophisticated," Gray says.